Big Trade Win-nebago Today! +$4,972! What’s up everyone? All right, so another awesome day of trading. Five green days in a row, $25,000 on the week. I’m up $77,000 this month. I’m loving it. Right now, we’re right around $285,000 on the year, 615, $616,000 in my account that I started about 14 months ago, with $583. So, the momentum is so hot right now but we’re just seeing opportunities day after day after day. Right now, the most important thing for me this month is that I keep my losses small. I’ve already had two big red days this month and half of my profits are going to charity so I really … It’s like I want to be aggressive, I want to try to swing for the fences because I want to have as much profit as I can so I can give away half of it. But, I don’t want to end up having a big miss and losing a lot of money. So, right now at $77,000 on the month, that’s about 38, $39,000.00 that I’m going to be donating at the end of this month which is crazy. You know, I’m still thinking 100K is within reach. $23,000 off that level, with about nine days left in the month. I think it could happen. I’ve got my fingers crossed but it’s really a matter of staying focused. A-quality setups, knowing when to put the pedal to the metal, knowing when to be aggressive and knowing when to ease off the throttle and slow down, all right? 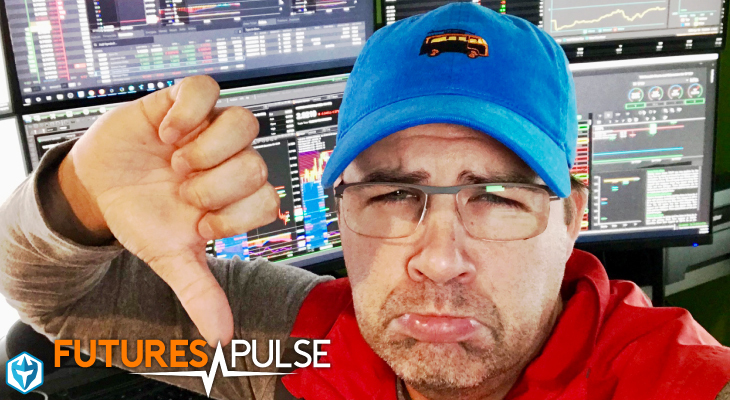 So anyways, we’re going to break down all of today’s trades and there’s a bunch of them in today’s midday market recap. All right, everyone. 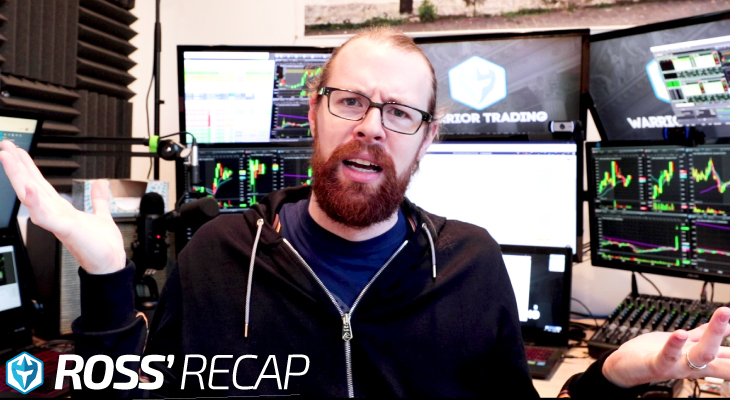 So we’re going to go over our midday market recap, the trades from this morning, finishing the morning up $4,972.20 which is awesome. That puts me up $77,000 on the month. So this is right now, it’s just been awesome month, fourth best month of all time. I’m $7,000 or 8,000 away from it being my second best month of all time. Anything above 85,000 will be second best month of all time and we’ve still got almost 10 days left in the month. So I think I’ve got a really good chance at having at least the second best month of all time and 100K is within reach. That’s the goal right now. I’m going to mute my alerts here. ORPN, this is one of the ones I did pretty well on today, about $4,000 profit just on this name. Really some nice clean moves. It’s been whipping around at the highs but now it looks like it’s breaking through and moving a little bit higher. So great job for those of you that have stuck around to trade this. So as you guys know, in honor of Memorial Day, I’m going to be donating half of my profits this month to various charitable organizations. I talked about this earlier in the week. My grandmother was a nurse in the army and that’s where she met my grandfather who is a soldier who got wounded. That’s how they met. I wouldn’t be here trading and teaching all of you guys to trade if both of them hadn’t been willing to step up and fight for this country and do what they did. Now, neither of them died in … While serving although they both died in their 40s and the thought was that it was from some things that carcinogens and stuff that they were exposed to in during the war. So anyways, I’m excited about this. I’m going to be donating to local charities in the Berkshires and which is where our new office is going to be, in Great Barrington, Massachusetts and I want to encourage you guys to make some donations as well. 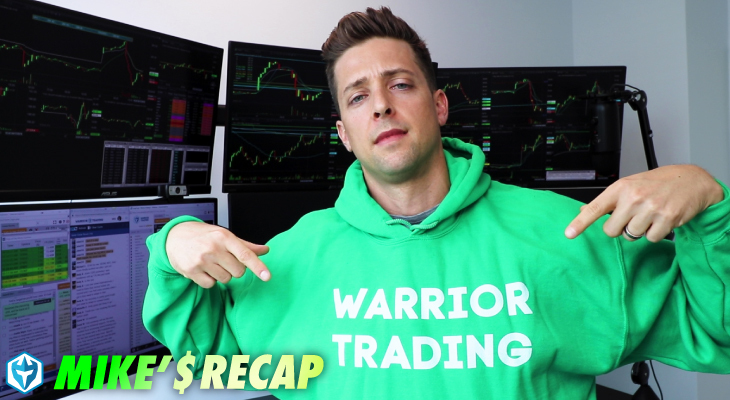 So what we’ve put together is a Warrior Trading Gives Back Challenge landing page. Let’s see. I’ll just pull this up on the screen so you guys can see it. We’re not collecting any money what we wanted you guys to do is if you are interested in making a donation to a local charity, really encourage you guys to stay local as much as you can, you can make a pledge and just say your name, email, the organization and the amount, send and then we’ll tally it up. So as of today, my contributions are going to be up to $38,500 which is awesome. The link I posted in the chatroom, Memorial Day Challenge. You guys can see it. I think if you Googled Warrior Trading Memorial Day Challenge, you would also find it. But you can see it right here, those of you on Facebook Live, you guys can see it as well. I would love to give back as a community. We’re all so fortunate to be able to make the amount of money we’re making. I saw Peter, you had one of your best days, $7,500 today, that’s awesome. I saw John, he made another $1,700 today. He’s already made a pledge that he’s going to be contributing. We haven’t updated it on the site yet. But I know Jeff is going to be contributing and so will Mike. So would love for you guys to step up and do something for your local community. It doesn’t have to be $38,000 like mine, it can be 50 bucks. It can be 100 bucks. It’s really the thought that counts. So this is something we’re going to do for Memorial Day, Memorial Day Challenge. Yeah, just encourage you guys to check out this page and make a pledge if you’re thinking about your local veterans. Okay, so anyways, just wanted to talk about that here at the end of the week. 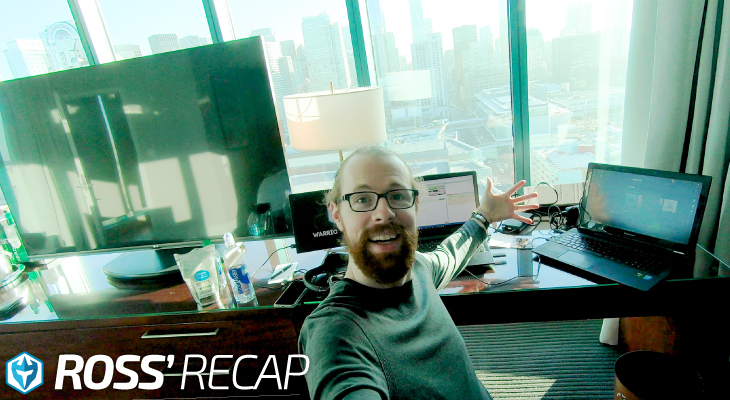 It’s been a great week, about $24,000, $25,000 in trading profits which is awesome. Really in a nice hot streak here. Let me show you my gains. So in my main account, $2,758, in the IRA account, $2,214, more than 10% growth in the IRA, that’s awesome. This has been a good week in the IRA. I’m up about $3,300 total profit in three trades. So I needed that. I started the week at $17,800 in the IRA and I’m going to be at 21,000 here starting next week. So only, well, $4,000 away from the $25,000 PDT level, right? Once I’m above that PDT level, I can day trade as much as I want. I’m not limited to the three trades per week. So really, it’s just a matter of waiting for these A-quality setups jumping in and getting a good sized win. I took ORPN in this account. I got in at … I put the orders here. I put out a bunch of orders at 3, 3.12, 3.13. The thing is I never know how much I’m going to get filled, especially with interactive brokers. It’s a lot of partial fills. So I just kept putting out orders. Bunch of them got rejected, insufficient buying power. But I did fill 4,000 shares. So I filled 4,000 shares, basically right at $3, 2.94, 2.96, 2.97. The strange little slow fills, a little at 3.08 and I sold it at 3.50. 50 cents on 4,000 shares was 2,000 bucks. So if I can do that a couple more times, I’ll get this account up to 25 grand pretty quickly. So nice trade there on ORPN. I’ll just pull up the chart on this. I’m going to minimize these windows. Minimize, minimize. So ORPN hits our scanners this morning. That’s how we find pretty much all of these stocks. They’re hitting our scanners. This one wasn’t on the watch list but the bell rings. We’re watching the scans and boom, there’s ORPN hitting at 2.87, 2.92, 2.99 and I’m looking at it and I know this is a former runner. This is a stock that has a history. As you can see it popping up some days here, from $2 to $4, $2 to $6. So it’s a familiar stock that likes to make these big moves, big dramatic squeezes. It doesn’t always hold those levels though, you got to be quick to take profits. Today it’s holding up fairly well. As soon as I saw them in the scanners, I knew the name and this is something someone asked me the other day, “Ross, how long did it take for you to become familiar with these types of stocks?” I would say probably about a year of trading to start to really recognize, “Oh, these are names. These are stocks that have squeezed up before.” You start to remember them. So ORPN is one of the ones I remember. Here, got in it $3. We get to move up to 3.24. I got in in my main account at 3. I took a couple of trades earlier, QTNT, just small little trades, VLRX. 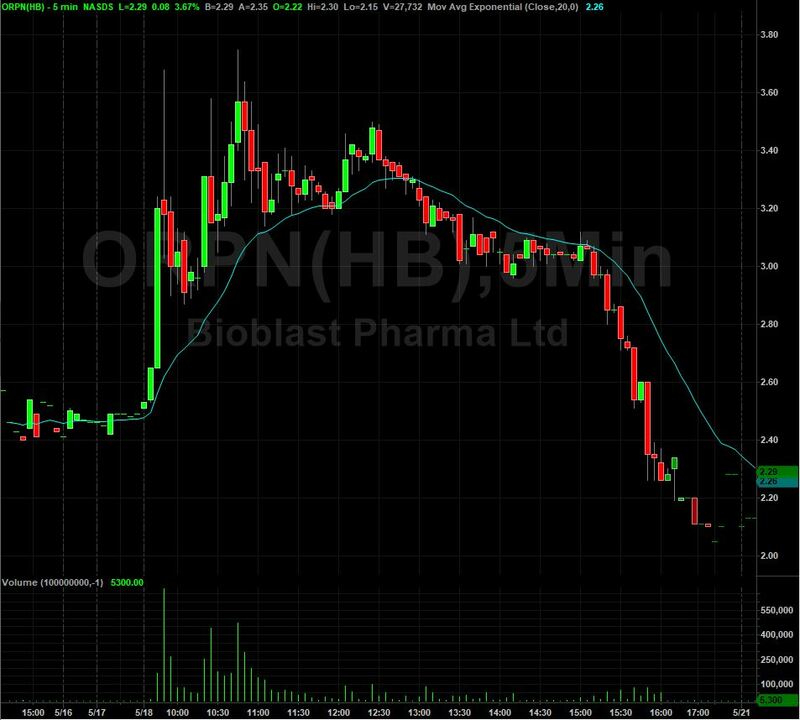 ORPN I jumped in as soon at 3.11 and 3.23 and added at 3.50. So being pretty aggressive. Trying to ride this momentum. It ends up hitting a high of 3.68. In my main account, I stopped out as it came back down. I stopped out at 3.48 which was okay. It was a good $1,500 winner but not as good as it could have been. It pulled back, dropped down and then I got back in on this curl, back up, the second move on the break of the VWAP. I didn’t take that one in my IRA but I did take it in my main account. It was the last trade I took in at 40, let’s see, where was it? 40, 40, partial fill, 43 and 45, a couple of partial fills, selling at 53, 46 and then the rest as it came back down at 22. So made another 500 bucks on it and I’m finishing up 1,900 on ORPN in my main account and the IRA account, $2,000, $2,049. So good trades on that one. It’s still higher than when I got in. It’s at 3.50 right now so that one’s looking good and continuing higher. 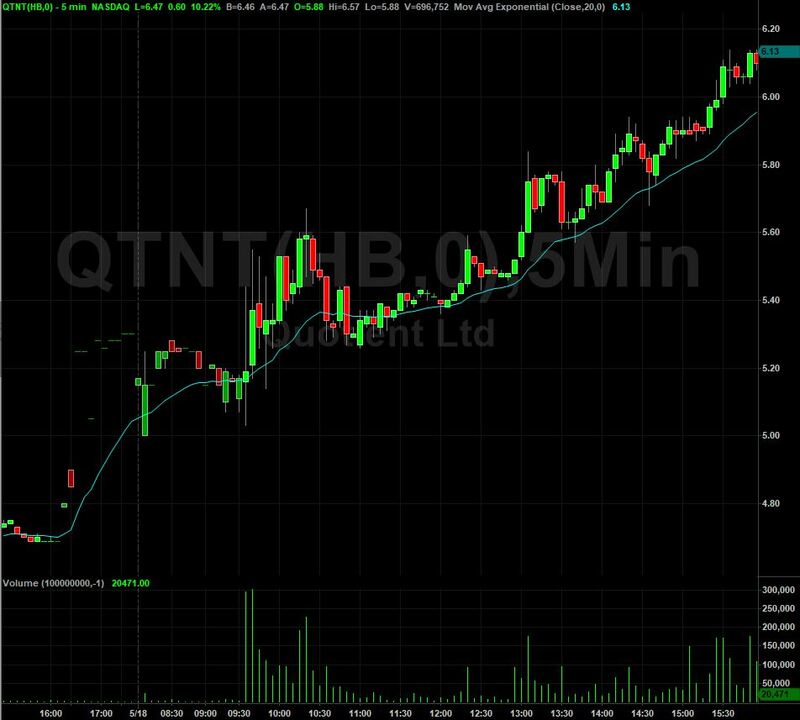 QTNT, I got in this one out of the gates off the high day momentum scanner at 5.27. It’s 5.30 right now. It hit a high of 5.65, a little choppy. I jumped in at I think it was on this kind of red to green move as it was starting to surge up, 5.27. It taps 5.44 and then drops back down. Made 400 bucks on 7,500 shares. Not a huge win, 5, 6 cents. Let’s see. LIVX, this one was not easy. I jumped into this at $9.90. It’s at $6.16 right now. This one, I was a little bit unsure about it. I saw some of you guys talking about it in the chatroom. I can’t remember. One of you guys said you got in at 7.50 and sold it up around 10. I got in at 9, actually I got in at 9.50 and 9.75 so I had a 9, an average right around 9.70. Pops up to a high of 10.20. I sold half at 10.05. Sold a little bit more as it came back down at 9.73 and sold the rest at 9.50. So my trades were all in this little zone here which is fine because that’s basically a scalp type of setup. But it clearly didn’t hold up. It consolidated sideways after dropping and then it’s continued to fade lower. So a little disappointing there that that one didn’t work out as well. But pre-market chart was a little bit iffy. That was kind of tricky. Next one, VVPR. This one, I tried to do a daily breakout trade on it. You can see here how it was consolidating at 75. I got in for the break right here over 75. 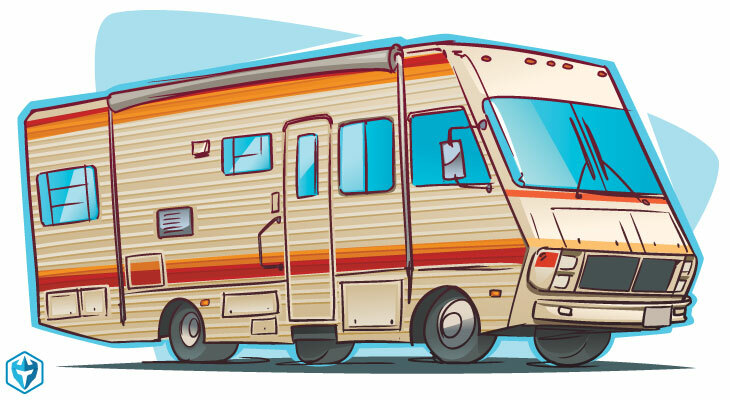 Would pop up to a high of 88. Couldn’t hold that level, came back down at 72 right now. So I only made $192 on that trade. VLRX, this was a gapper that we were watching this morning. I tried to get in before the break at $2, in at 99, stopped out at 1.90, it’s been going lower since then. Lost $259. IHT, I jumped into this one at before break over the half dollar at 2.50. It hits 2.76. I stopped out at 2.40 for a $298 loss. A small loss there. Then KALY, another one. I jumped into it 3.10. It pops up to a high of 3.40. It doesn’t hold those levels and comes back down. KALY’s another name that is a former runner. However, what happens very often on this are these big [DOGI 00:13:19] candles, so, or tapping tail candles. So that big upper wick, it squeezes and doesn’t hold those levels and it comes back down. So it’s one that you have to be a little careful of. Today, it didn’t hold up super well again. So it’s kind of getting maybe overplayed and I probably should live it alone for a while. Similar to LEDS. A stock that was fun and then just ended up getting just a lot of false breakouts and a lot more difficult. So I took a small scalp on KALY in my IRA but I only made 165 bucks. So with that, I have three days for this week in the IRA. So I’m not going to be able to trade in it again until, let’s see, some time next week. My first trade in the IRA this week was on, let’s see what day was that, it was actually on Wednesday. So I took a trade Wednesday and then I took two trades here on Friday. So I’m not going to be able to trade in the account again until next Wednesday because of the 5 cent, because of the five-day PDT rule. Yeah, so I got to wait till next week. But that’s fine. Whatever. Did a good job this week. Account grew by 10% and more than that actually. If I can get a couple of good trades towards the end of next week or the following week then that might help me get up closer to $25,000 by the end of the month which would be awesome. That would be a really big milestone. All right. So that’s about it for me. How many shares on the IRA? 4,000 shares on KALY and I think … Sorry, 4,000 shares on ORPN and KALY was, I’m not sure, it’s kind of hard to tell just the way it is here, 2,500, 3,000, it looks like 4,000 shares also in KALY, maybe 5,000 shares on KALY. KALY might have been in a little bit of a bigger position and I was selling … I basically hit the bid and I filled some of it at 35 for profit and then the rest down at 12. So kind of slippage on my exit there but that’s okay. I’d rather have a smaller winner than a loss. So anyways, that’s about it for me today. Another great day of trading. It’s been an awesome week and I’m looking forward to hopefully having a $100,000 month. I’m about 22, $23,000 dollars off that level. So a couple of good days next week, it’s going to happen. But I have to be careful because I had a day this month where I lost 13,000 in one morning. So I’ve got to be aggressive when the momentum is there, when the markets are hot and I have to sit on my hands when things start to get a little choppy. So that’s going to be really key for my success this month. All right. So I hope everyone has an awesome weekend. Get some rest. Those of you that are in the classes, study up. Monday morning is going to be here before you know it. I want to make sure you guys are able to capitalize on the hot streak that we’re seeing right now. Okay, so I’ll see you all first thing Monday morning, 9, 9:15 for pre-market analysis. All right. See you guys in the morning.